The [fill in the prefix]est thing I saw today: The Advertainment-iest video I watched today. The Advertainment-iest video I watched today. I do not even know where to begin with this. It is happy and silly and sort of depressing all at once. 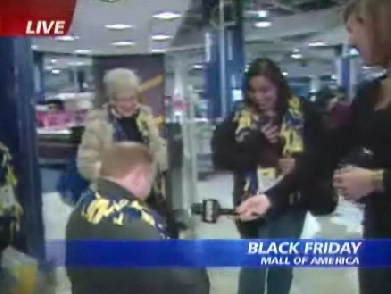 Silly because it took place live on the morning news at a Best Buy Store on "Black Friday". Sad because it took place live on the morning news at a Best Buy Store on "Black Friday". Just the term "Black Friday" is silly to me. I mean, sales are awesome! Sales are red! Proposals are very personal and to mazal tov them! And congrats on those values that Best Buy. I hate that store, but it is a local business and we need all those jobs. That'll be $10 for the advertising, Best Buy. "i can't imagine anything better," she says. i think it's just so sweet. whatever works people! The Forearm-iest things I saw today. The proudest result I saw today! The voting-est thing I saw today!